This cordless kettle has been designed with economy in mind. Marked with one, two or three cup fill levels so you only boil the water you need, it has a concealed element, 360º rotation and a Strix controller with lift off switch off and boil dry safety features. Also, with the advantage of a generous spout for easy pouring. The ultimate hotel kettle. 1.0 litre. These kettles are excellent quality. They are sturdy and look attractive on the trays. We decided to change all of our electrical kettles to the one brand and capacity. 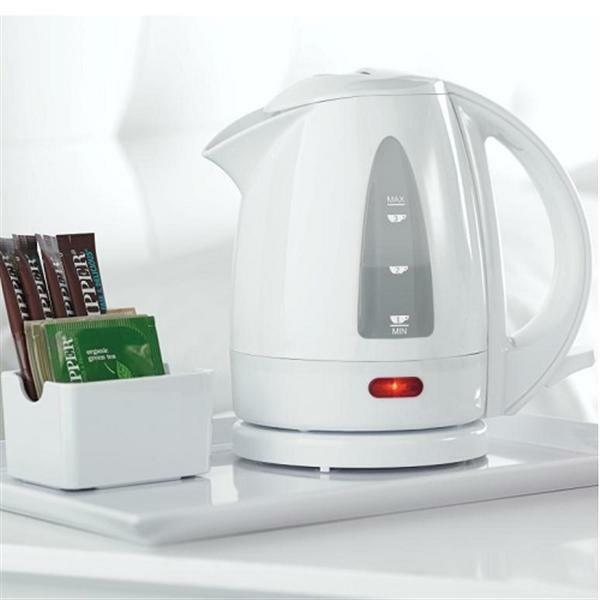 The Eden Hotel Kettle is excellent value, good quality and looks great in each of the rooms. Excellent little kettle, much better for guests making tea than the standard size.